Brrr... how cold is it? It seems that winter has come early to Melbourne, with cold winds, dark skies and rain. Booo. Isn't it meant to be Autumn for another two weeks? The optimist in me thinks that summer might come early this year! But the realist in me thinks: soup. 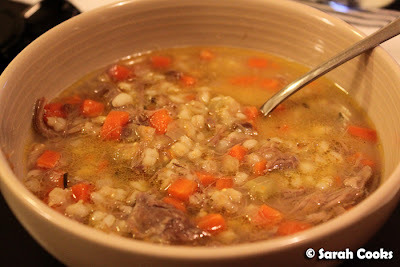 I created this recipe after I got obsessed with the idea of having a braised lamb shank and barley soup, but couldn't find a recipe in any of my books. 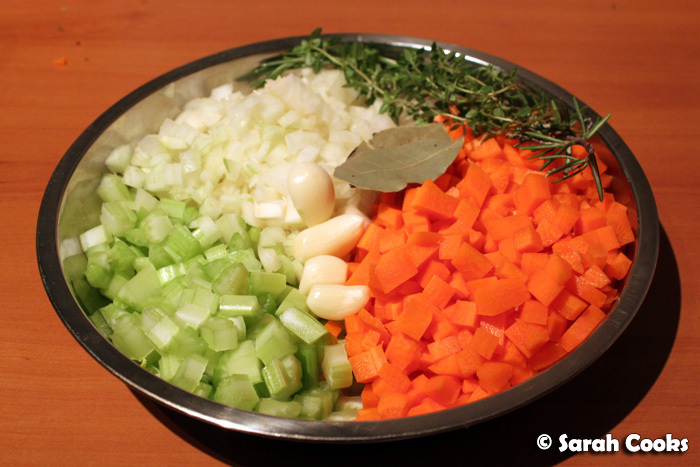 ... and a mirepoix - finely chopped onions, celery and carrots, with garlic and herbs. I marinated the lamb and veggies overnight in white wine. The next day I browned the lamb and veggies in a pan, then added chicken stock and slowly simmered the whole lot until the meat was tender and falling off the bone. I added cooked barley at the end, and that was that. I've written the full recipe at the bottom of this post - enjoy! It made enough for four meals, but is easily doubled as long as you've got a big enough pot. 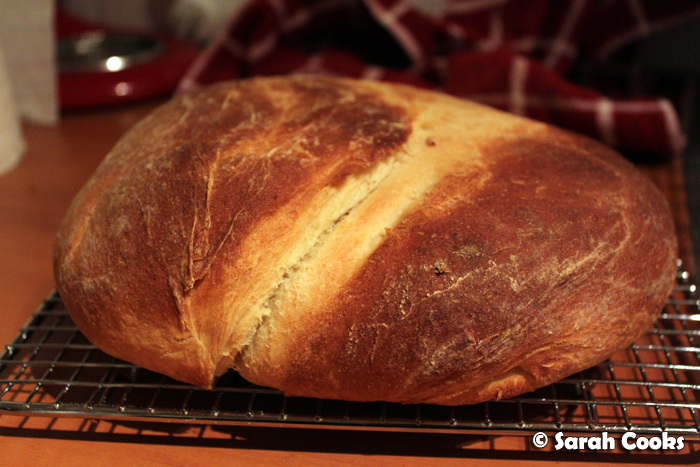 It's incredibly warming and nourishing, without being heavy or stodgy. Definitely going to make this again this winter! It took a couple of days to make in total, but for most of that time the soup was doing its own thing - marinating in the fridge, bubbling away on the stove - without any effort on my part. I used white wine, rather than red, as I wanted a light, clear broth, and because I wanted to serve it with a 2009 Heggies Vineyard Reserve Chardonnay! (My favourite of all the white wines tried on my trip to the Barossa). An unconventional pairing, perhaps, but I thought it was a great match. I served it with a loaf of potato bread (from Nigella Lawson's How to be a Domestic Goddess), which is a standard white loaf with mashed potato added to the dough. 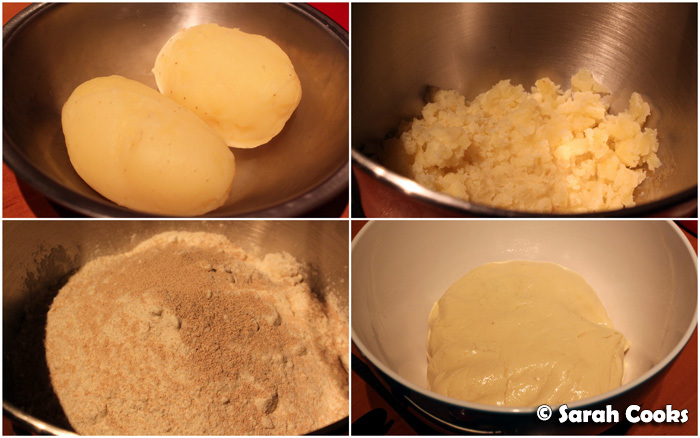 The baked bread has a wonderful potato fragrance, a lovely thick crust, and is slightly more substantial than a plain white loaf. As Nigella writes, it's perfect for dunking into stew juices. Delicious. What are y'all cooking for these wintry Melbourne days? Peel the garlic, and chop the onion, carrots and celery into uniform-sized cubes. Place all the veggies in a non-reactive bowl with the lamb shanks, herbs and white wine. Cover with cling wrap and refrigerate overnight. Drain the vegetables and lamb shanks (reserving the wine!). Heat the garlic oil in a large pot. Brown the lamb shanks over a medium-high heat and set aside. Add all the vegetables to the pan, and cook until softened and lightly browned. 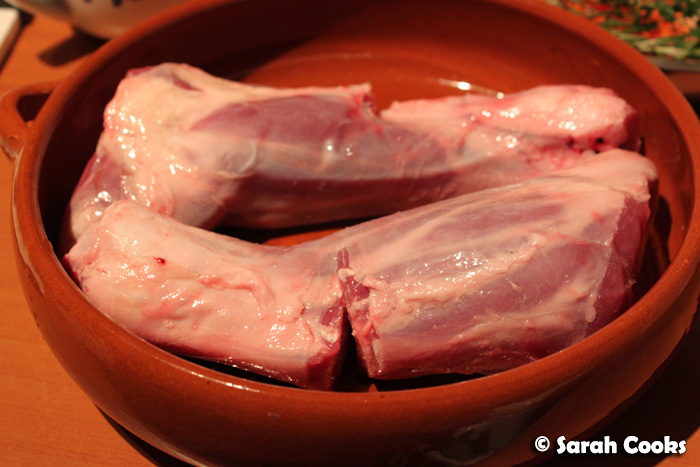 Return the lamb shanks to the pan, as well as the wine. Add enough chicken stock to just cover the lamb shanks. (You may need more or less stock, depending on the dimensions of the pan). 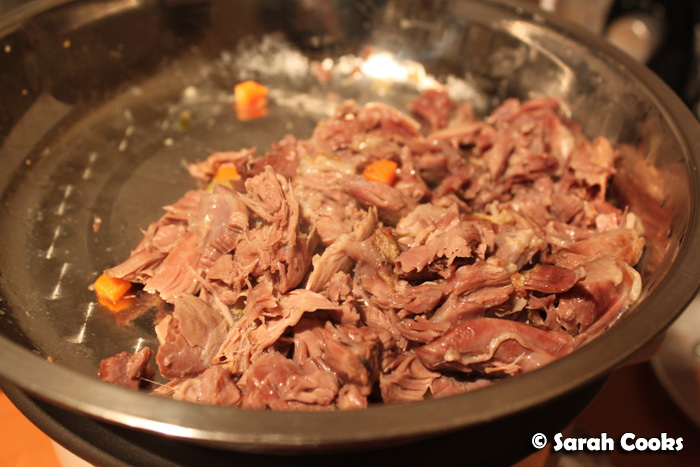 Bring to the boil, then turn the heat down and simmer for 1-2 hours or until the meat is tender. Remove herbs and garlic cloves and discard. Take the lamb shanks out of the pan, and shred the meat from the bones with a fork. Return the meat to the pan, and let it cool overnight. The next day, scrape the fat from the top of the soup, then put the pan on the heat and bring to the boil. Add the barley, and cook for 30 minutes or until the barley is tender. (Refer to the packet instructions). Scoop into individual bowls, and drizzle with extra virgin olive oil to taste. Serve with chunky pieces of toast. This looks so comforting especially in the weather we've been having. I want!!! 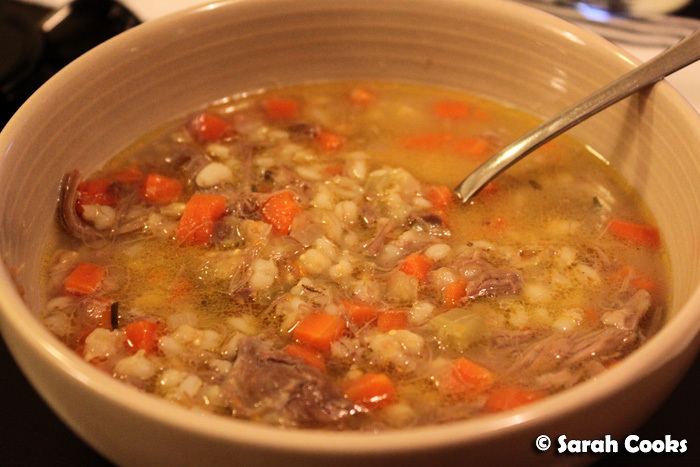 My Nana never marinated her lamb shanks for her lamb shank soup! More's the pity perhaps;) Anyway, Nana never wrote her recipes down so it's lost to the ages unfortunatly. Sounds such a comforting dish Sarah. 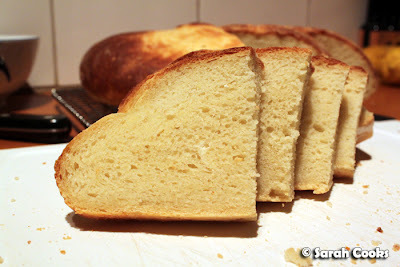 That potato bread is one of my favourite breads ever - not just favourite Nigella breads. The texture is gorgeous isn't it? You know I still have no idea what it's like toasted because we eat it too quickly. I made a lovely soup from Jamie's dinner cookbook last week and it was perfect to go with the cold canberra weather we are having.